Fight waves of enemies in a "foggy Russian countryside" in the next round of Ghost Recon: Future Soldier DLC. Hot on the heels of Ghost Recon: Future Soldier's Arctic Strike DLC, Ubisoft has announced the next round of downloadable content for the shooter. Due out September 11 for the Xbox 360 and PlayStation 3, Raven Strike will have three new missions in the game's Campaign Mode, as well as a new map for Guerilla Mode. 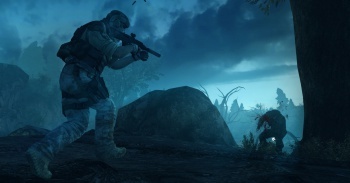 The new Campaign Mode missions are Secure Dawn, set in a technology-free Kazakhstan marsh; Cold Walker, which takes place in a Russian train depot; and Moscow-based Argent Thunder, in which players will experience "a nighttime urban setting." Additionally, the new Guerrilla Mode map, Sawmill, is set in "a foggy Russian countryside," and will have players facing up to 50 waves of enemies. Raven Strike will be available for 1200 Microsoft points, of $14.99 in real money. No date was given for the PC version of the DLC, though the press release mentioned that Raven Strike will be available on Windows PC at a later date."